More than 4,000 species of plants and animals live in the lagoon watershed, making this region one of the most biodiverse places in the continental U.S.
More than 4,000 species of plants and animals live in the lagoon watershed, making this region one of the most biodiverse places in the continental U.S. Just as maintaining biological diversity is essential in the health of the earth’s ecosystems and its resources, so to is it important to maintain in the Indian River Lagoon, else we risk losing it and all it provides us and our economy. Each type of biodiversity is linked to the health of the others, and together they comprise the wealth of ecosystems. Fifty-three species of threatened or endangered animals live within the lagoon’s watershed with Merritt Island National Wildlife Refuge alone containing more than any other national wildlife refuge in the U.S.
Seagrasses are perhaps the single most important habitat in the IRL because so many other species depend on them for food and habitat. The IRL is sometimes known as the “seagrass-based ecosystem” due to the nature of seagrass being the predominant plant-based food source for animals in the lagoon. 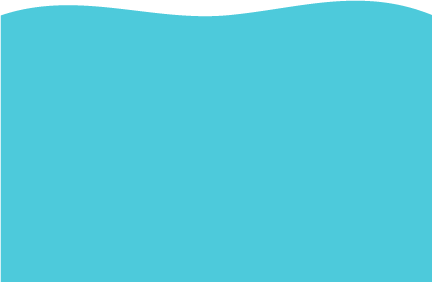 For this reason, and for the fact that their growing habits change depending on the water quality, they serve as a barometer for gauging the overall health in the lagoon. Seagrasses are also valuable to the lagoon because they enhance water quality by removing nutrients and stabilize sediments. Florida has 3 species of mangroves: Red, black and white. Mangroves dominate the IRL shoreline in natural areas. They act as a habitat for numerous animals such as by providing roosting and nesting areas for the Lagoon’s birds. Their leaves act as a food source for fiddler crabs, mullet and other animals. Roots are also important habitats for stationary creatures such as oysters, mussels, sponges, tube worms and sea squirts that settle onto the roots. 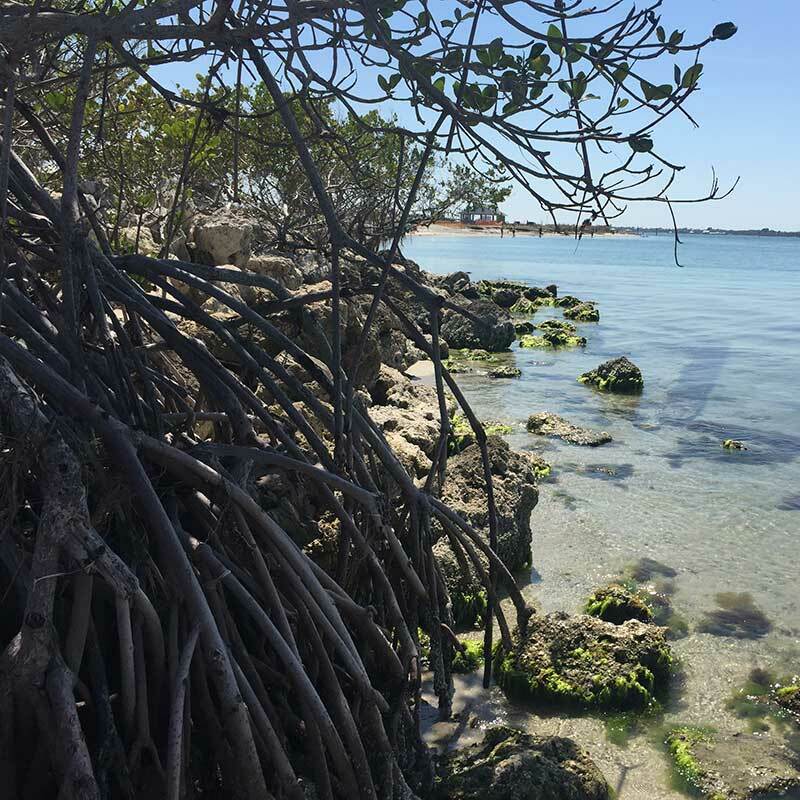 Well-developed mangrove areas provide protection from damaging hurricanes, assist in stabilizing shorelines to prevent erosion and help trap sediments and pollutants running off from the land. Seven species of seagrasses are found in the IRL. 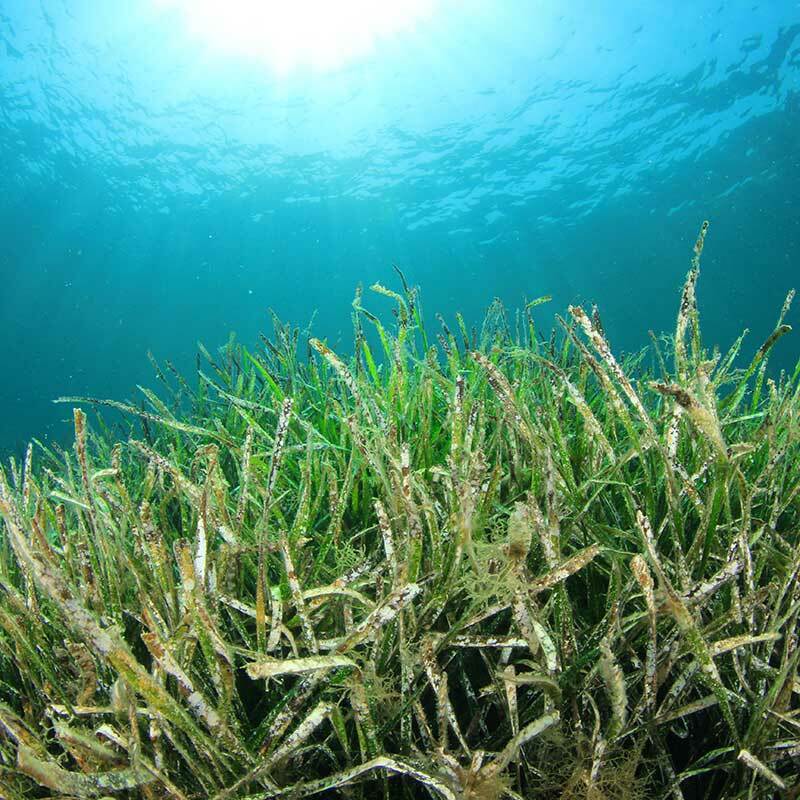 Seagrasses are sensitive to water quality conditions and tend to reflect these conditions in their growth habits. For this reason, they are excellent barometers of overall lagoon health. When water is clean and clear, seagrasses grow well. If conditions deteriorate, they grow poorly and sometimes disappear. Seagrasses provide critical habitat and nursery areas for estuarine animals. Most fishes in the lagoon spend at least part of their lives in seagrass habitats where they can remain hidden from larger predators while finding ample food. 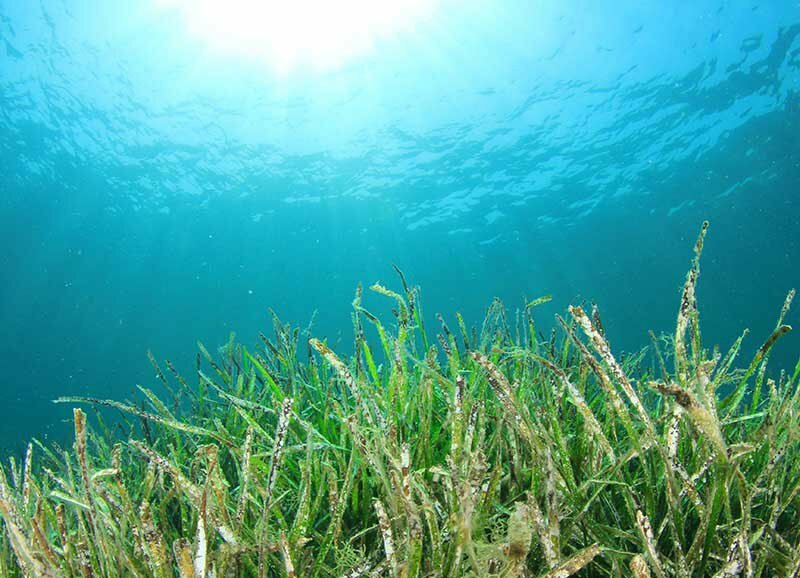 Seagrasses enhance water quality by trapping sediments and removing nutrients from the water. There are approximately 25 species of wading birds in the IRL including herons, egrets, ibises, spoonbills, and sandhill cranes. They are important sentinel species because, as top predators, their health reflects the health of their prey species, which in turn, reflects overall habitat and water quality in the environment. When wading birds are present in an estuary, it typically means that water quality is good and supports ample food resources. 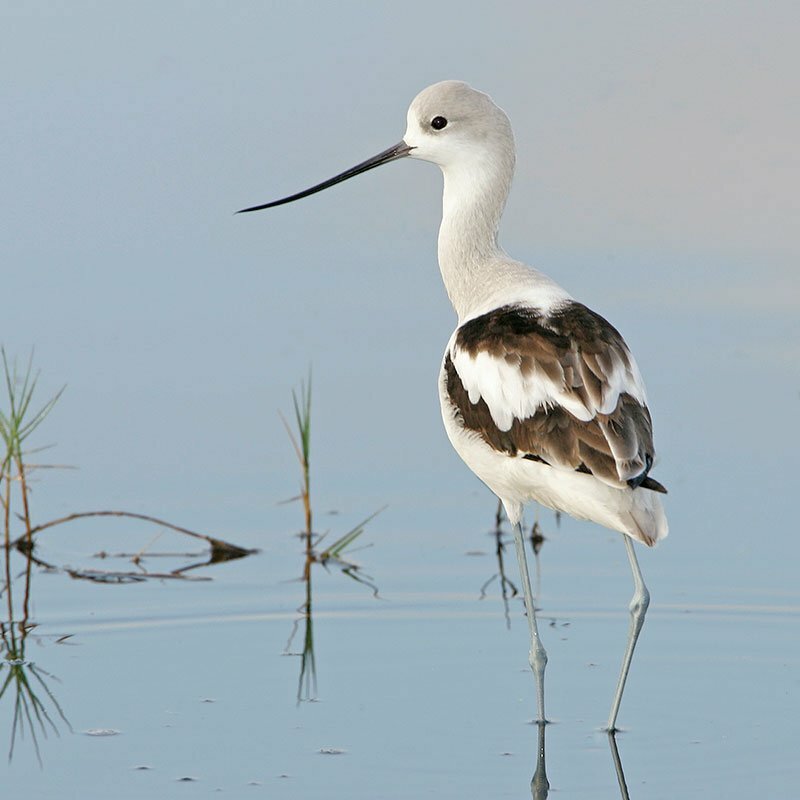 Stormwater runoff, sediments and other pollution sources that cause muck deposits and other issues can reduce the abundance of invertebrates and fish that wading birds prey upon. When food becomes less available, these birds will relocate to more suitable areas. 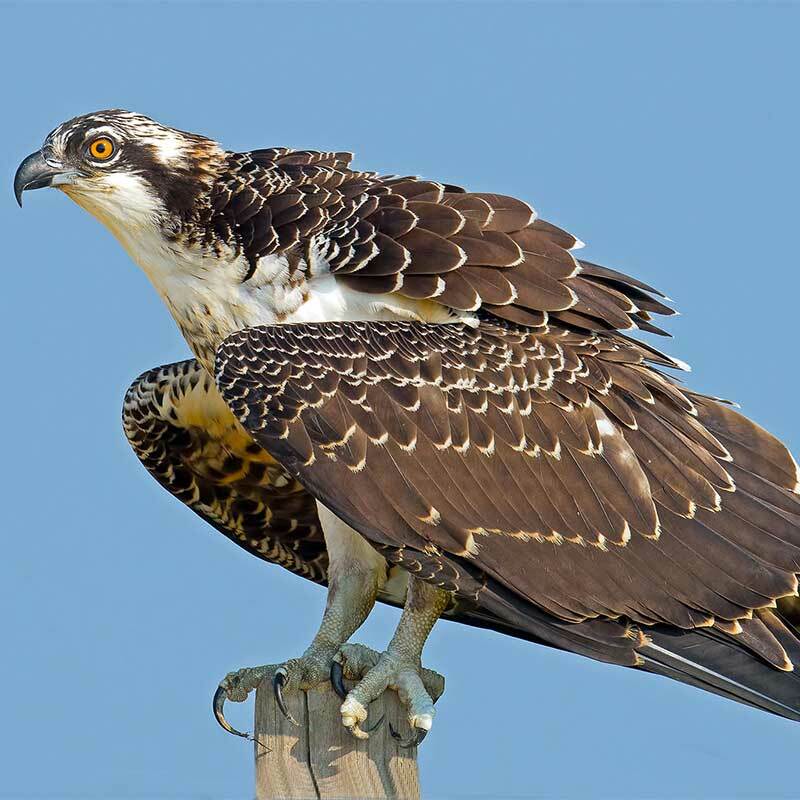 Also called fish hawks, osprey are distinctive residents that often build large nests atop dead trees or utility poles sited adjacent to the Lagoon. Their diets consist almost exclusively of fish, which they hunt by plunging feet-first into water to grasp prey with their talons. Ospreys form bonds with mates by performing aerial flight displays and by courting mates with food. Pairs may use the same nest site year after year, adding material to it each season to eventually produce a huge nest. Both partners incubate eggs, but once hatched, the female remains on the nest to protect the young while the male brings food. Scrub jays are extremely habitat-specific and are found only in the sandy scrub habitats of Florida found on the barrier islands in back dune areas and along the mainland coast. Scrub is characterized by having dry, sandy soils, and low-growing shrubs with few, if any, tall trees. 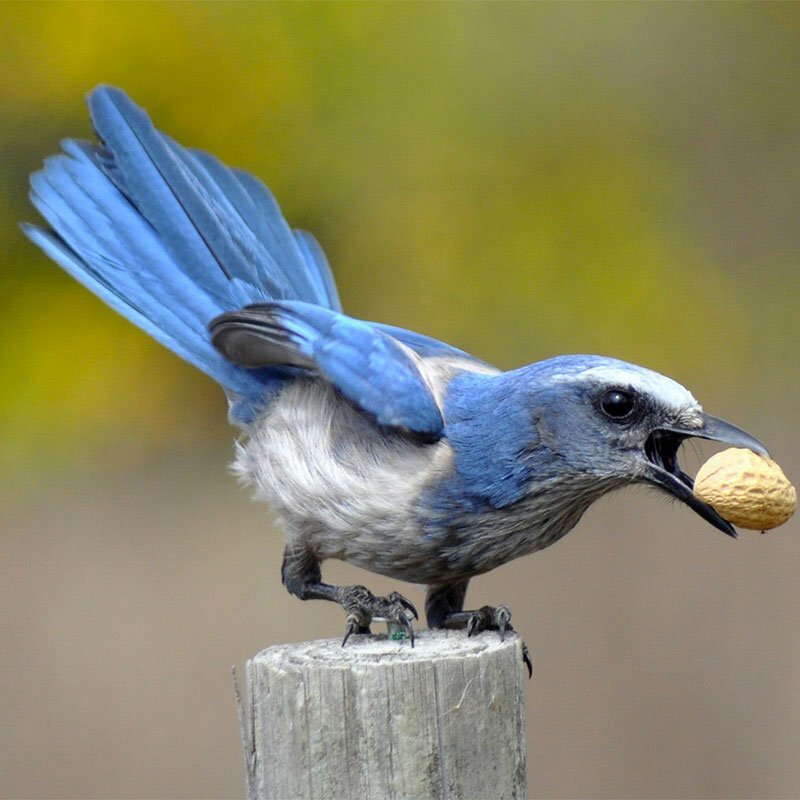 Scrub jays live in family groups and breed cooperatively, meaning that some birds breed while others act as helpers to defend territory, raise young, and stockpile foods. Scrub jays are a threatened species, primarily due to the disappearance of suitable scrub habitats, which are also prime areas for coastal development. Fewer than 5% of birds in a territory migrate further than 5 miles away from where they were born. Ten species of rays occur in the IRL including 3 species of stingrays, the manta ray, spotted eagle ray and cownose ray. Relatives of sharks, rays have evolved flattened body. 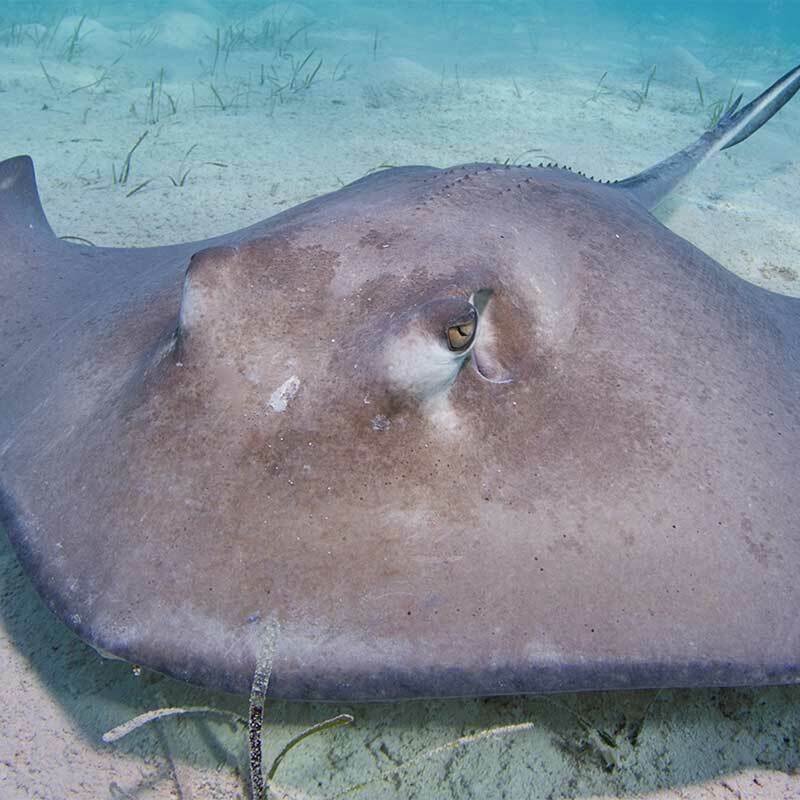 Rays have the ability to detect the electric field around other organisms and use this ability, along with excellent senses of touch and smell, to detect prey items. Rays eat invertebrates such as worms, crustaceans, bivalves, and brittle stars. Many feed by settling on the bottom and lying motionless. If they detect prey, they excavate a shallow pit with their pectoral fins. This serves to both expose prey items buried in the sandy bottom and helps to contain prey once it is exposed. The IRL is a vitally important nursery region for bull sharks. 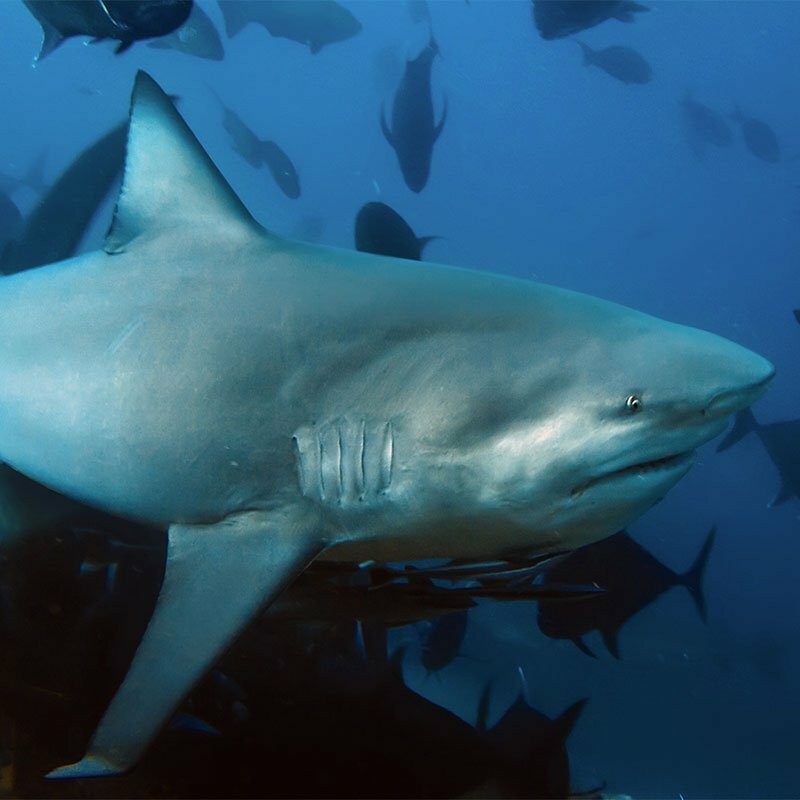 Female bull sharks enter the IRL in the spring when they are ready to give birth after carrying their offspring for approximately 10 – 11 months. They bear between 1 and 13 pups, which are typically born in seagrass beds and near mangrove habitats. They feed primarily on stingrays, fish, and turtles. Most bull sharks in the lagoon measure less than 3 feet in length. Young sharks often remain in the IRL until they reach 6 feet in length, then they migrate to offshore adult habitats. Mature bull sharks can reach 9-11 feet in length and weigh 500 pounds or more. These gentle giants of the IRL may reach an average of 8 – 10 feet in length and weigh 1,000 pounds. Most of a manatee’s diet consists of seagrasses and other aquatic plants, which they graze from the lagoon bottom. For this reason, manatees are also called sea cows. It is a misconception that manatees harm seagrasses by tearing up their roots. They seldom tear out the underground stems or roots from these plants. It is estimated that the population of manatees in Florida is 6,250 a number that continues to increase. 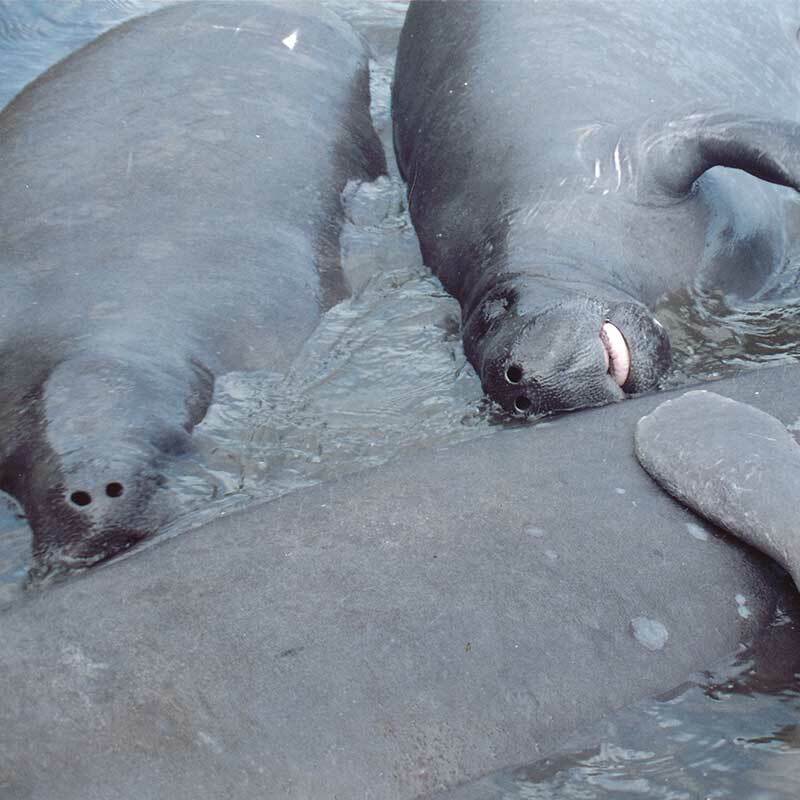 Manatees remain vulnerable to a number of threats however, including loss of habitat and feeding areas, cold stress, entanglement in fishing gear, and collisions with water craft. This well-known and charismatic species is a common inhabitant of the lagoon. Dolphins may be full-time residents of the IRL or may visit it from time to time from offshore. They range from 6 – 12 feet in length and may weigh 300 – 1400 pounds. Dolphins can live more than 50 years, with females tending to outlive males. 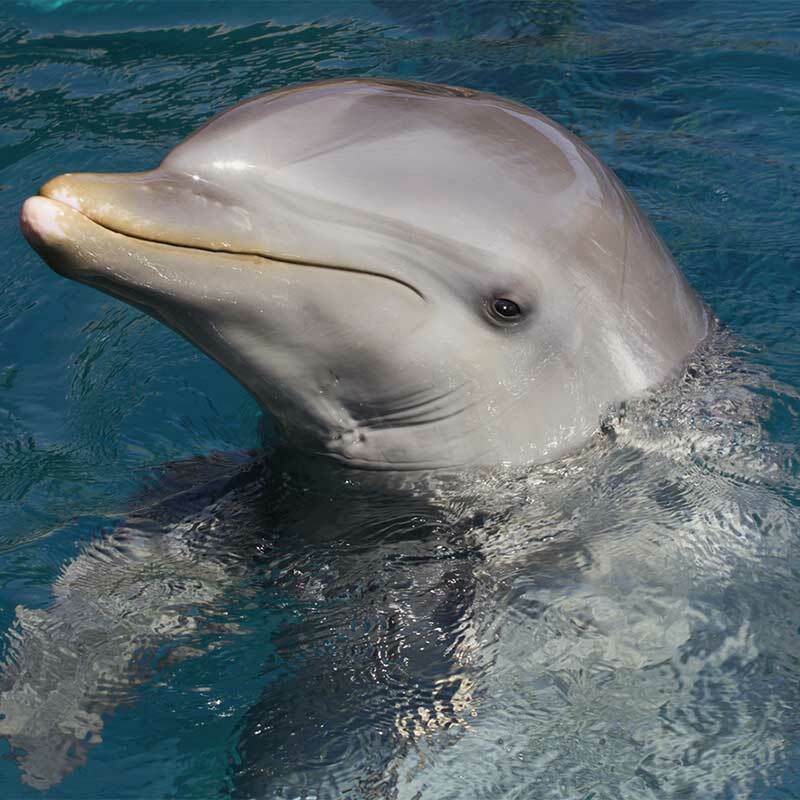 Dolphins can be found singly or in groups that hunt cooperatively to feed on invertebrates and fish. Females carry their calves for 12 months, and have an average of one calf every three years. 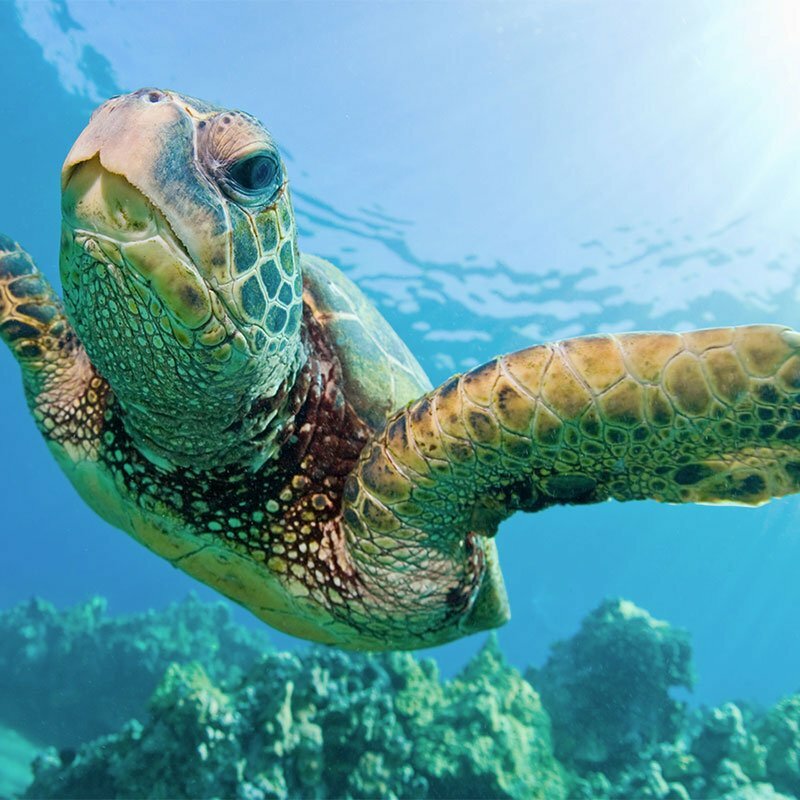 Five species of sea turtles occur in Florida: green, loggerhead, leatherback, hawksbill, and Kemp’s ridley. Most of the loggerhead population in the Atlantic nests on Florida’s beaches each year, forming the largest nesting concentration of loggerheads in the world. The diets of sea turtles vary widely. Green turtles, for example, are completely vegetarian as adults; hawksbill turtles feed primarily on sponges and other soft-bodied reef organisms; loggerhead and Kemp’s ridley turtles have jaws that are adapted for crushing their crab, mollusk, shrimp and jellyfish prey; and leatherbacks have delicate jaws adapted for soft bodied organisms like jellyfish. The IRL is one of the premier inshore saltwater fishing areas in the U.S. and offers world class gamefishing experiences to anglers of all abilities. 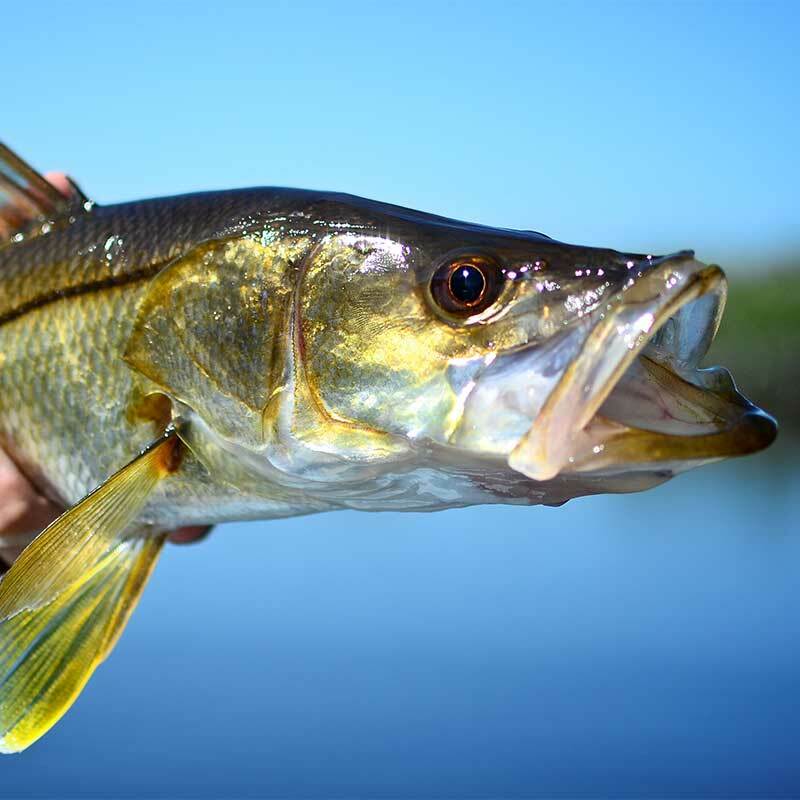 Big gamefish such as snook, tarpon, redfish, and seatrout are perhaps the most prized fish targeted. However, the lagoon’s diverse fish population offers a wide variety of desirable species including ladyfish, snapper, black drum, croakers and sheepshead, as well as many seasonal migratory species like flounder, bluefish, jacks, and pompano. There are about 160 species of bivalves that inhabit the lagoon. 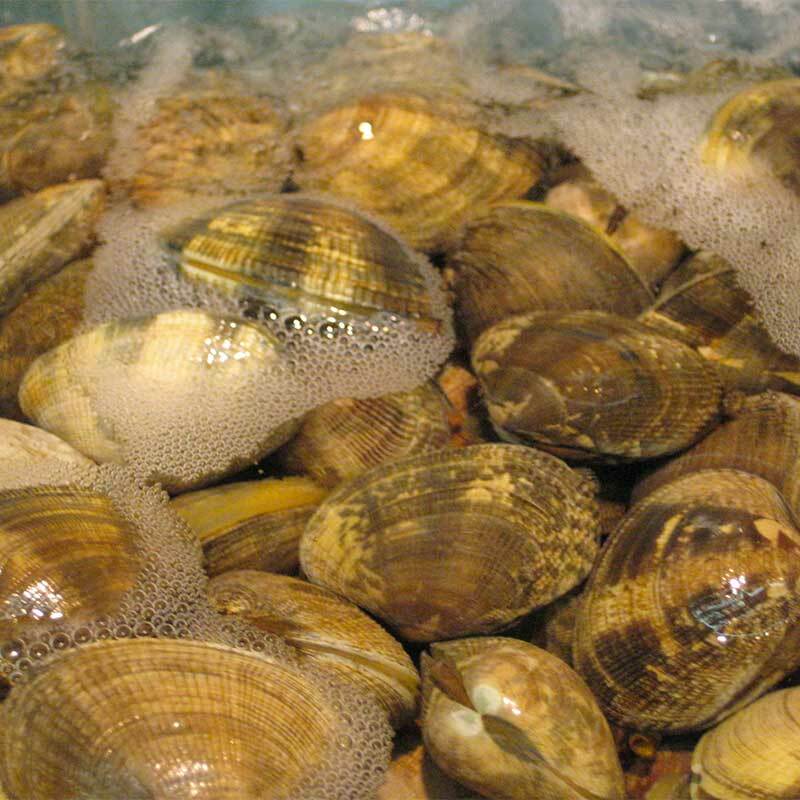 This includes clams, oysters, mussels, arks, cockles, coquina and other shellfish types. Bivalves are important to the lagoon because while feeding, they remove small particles, algae, and other materials from the water, helping to improve water clarity. Oysters have proven particularly important in this role. A single adult oyster is capable of filtering 30 – 50 gallons of water each day. Tens of thousands of individuals may inhabit an oyster reef, providing tremendous water quality benefits each day. In recent years, a number of organizations have developed robust, highly-successful volunteer efforts focused on restoring filter feeders to the lagoon. Terrapins are unique because they prefer to live in the brackish salt marshes and mangroves of estuaries rather than in freshwater. They survive their salty conditions by secreting excess salt from tear glands and by drinking rainwater. In the late 1800s, terrapins were hunted for turtle soup and populations declined almost to the point of extinction. However, harvest limits helped terrapins recover. 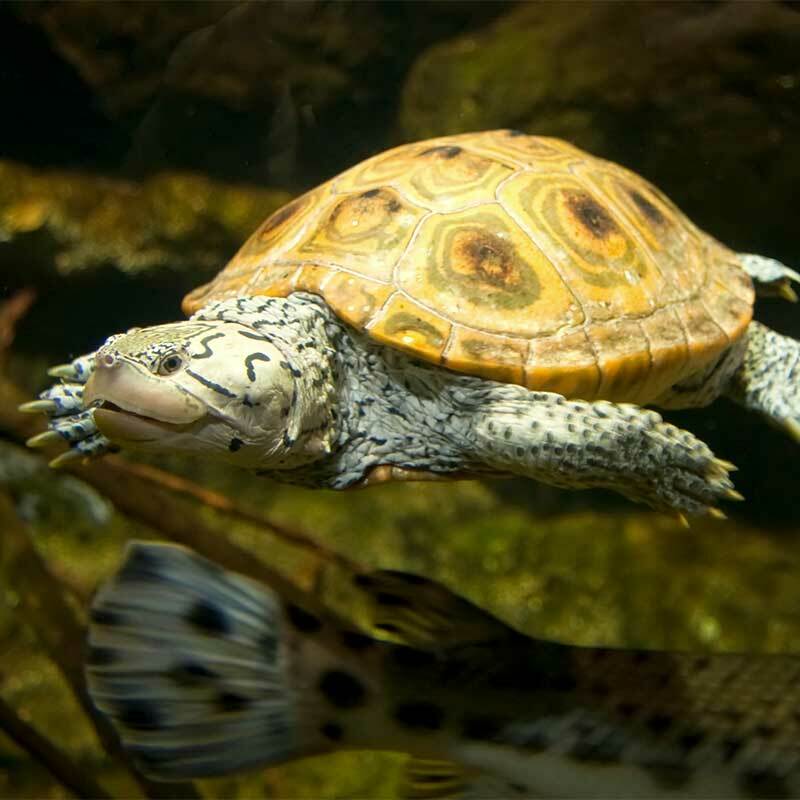 Today, terrapins are threatened by habitat loss, drowning in crab traps and other fishing gear, and predation from racoons and other animals. 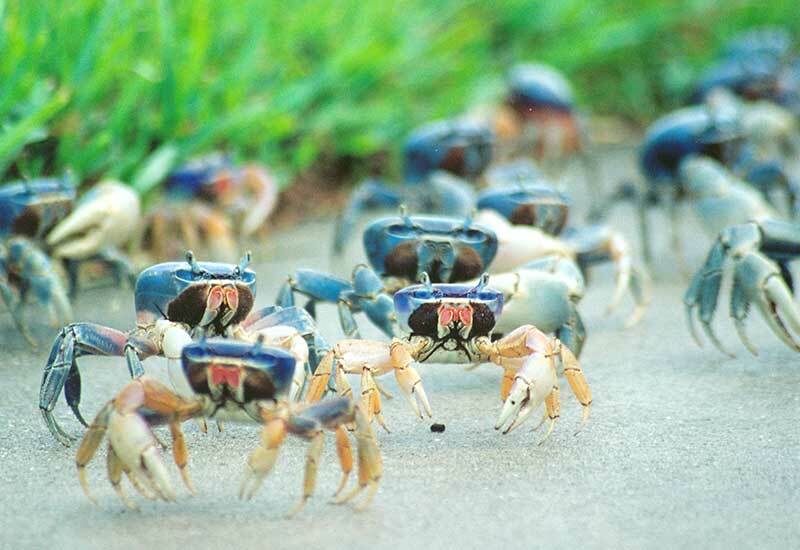 Eight species of fiddler crabs occur in the IRL. Fiddler crabs are common along the shoreline of the lagoon and can often be found in large groups feeding along the shoreline. These tiny crustaceans are easily identified by the unequal claws of males, who have one greatly enlarged claw and one small claw. 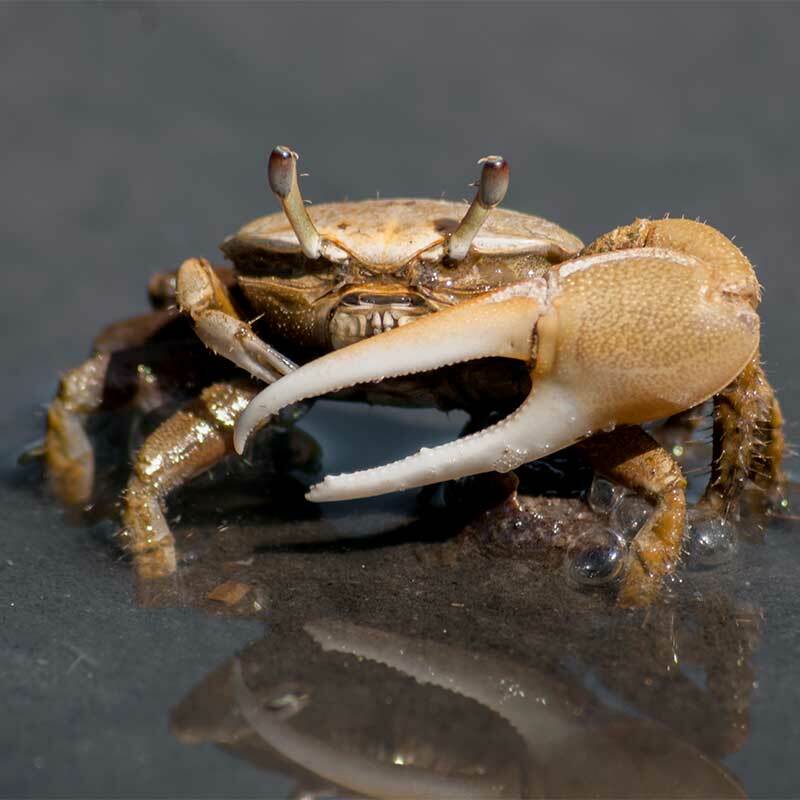 Rather than helping the male fiddler crab feed, the large claw actually makes feeding more difficult because fiddlers are detritus feeders. This means they eat decaying mangrove leaves and aquatic plants, algae and bacteria. Females incubate their eggs for about two weeks inside a burrow in the sand. When the eggs are ready to hatch, the female returns to the surface to release them into water. 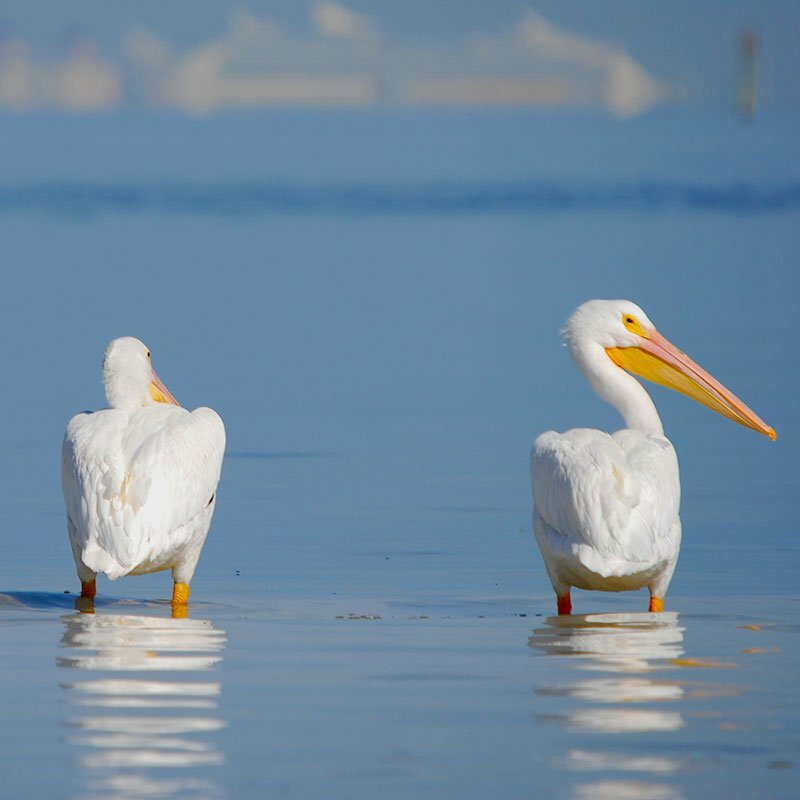 Two species of pelicans are found in the IRL: brown pelicans, which are present year-round, and white pelicans, which visit during the winter. They are common throughout the lagoon region and are often found in large groups when nesting on the lagoon’s spoil islands, or resting in marina areas. Brown pelicans feed almost exclusively on marine fish and crustaceans that they capture by diving head-first into water from heights of 20 – 45 feet. The large bill pouch of a brown pelican can hold about 3 gallons of water and is used like a dip net during prey capture. It can also be used as a feeding trough for young pelicans learning how to capture food.